A hashtag is a word or phrase that starts with what we often call the fence or hash sign, #. It is used in social media and becomes a form of categorization of what you write. You can for example use a social media hashtag to clarify what you write, but also for more people to find you and thus get more followers. Once you have created a hashtag, it frequently becomes a link that you can click on it to view all posts where precisely the tag used. 10 ways to secure your #Wordpress website. Come to Panzon’s on #CincoDeMayo for special prices on Margaritas! 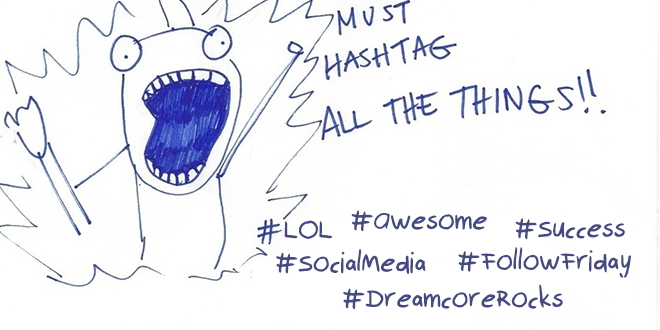 It is important to follow best practices when using social media hashtags. Your goal is to gain more followers or clients, not annoy people and drive them away. Do use 1-2 hashtags, keep it short, simple and relevant to your topic or brand. Don’t spam, or use long irrelevant hastags #OMGIFinallyGotADate is bad #FirstDate would be better. If you write about your company, your services or products so be sure to tag them. Create a strategy for your brand that you can use as a hashtag in related posts. For example, KitKat uses #GiveMeABreak even their customers use these when they write about their products or posting pictures on Instagram so the campaign gets more visibility. It should be unique, yet short and simple. You want your brand hashtag to be easy to remember by your customers. What hashtags can I use? Use what you like; No one owns the right to use a particular hashtag. But keep in mind that they should work together with your brand. One tip is to listen to your audience uses a special hashtag when they use, show up or feels on your products / services. Another good way is to find hashtags that are popular within your target market in general. Research! There are several websites that monitor hashtag trends. One of my favorites is Hashtagaify.me because it has a simple interface and allows you to find hashtags related by keyword. What Social Media networks use Hashtags? Hashtags are used on Twitter, Instagram, Pinterest, Facebook and even Google+. On Twitter and Instagram is tagging process more obvious, but it will more and more also on Facebook. The big difference here is that Facebook includes you (as an individual) are often in a more closed circle. While you’re on Instagram and Twitter often have an open profile and is more positive to spread your content. Then it becomes more natural to use hashtags there. Facebook, however, says that they will review the way it should be easier to use Hashtags also among them. There are several frequently used Hashtags in social media that can be a bit difficult for a beginner to know what they mean. Such #tbt #throwbackthursday, which you use when you post an old picture on Thursdays. One way to remember the past. Find a Hashtag and not sure what it means, TagDef.com is a great site that will help you find their meaning. Lastly, Hashtags.org is a great site where you can view and search what’s trending. What Hashtag strategy do you use? Please share I’d love to hear your feedback below. ← Google MobileGeddon: What you need to know!